Home>New Songs>Wyclef Jean Songs> Wyclef Jean & Canibus Team Up On "Letter To Canibus"
Wyclef Jean & Canibus join forces on "Letter To Canibus." It's been a few months since Wyclef Jean released his last project, Inspired By. The project found Wyclef Jean putting his spin on some of the most popular tracks in recent times including songs from A$AP Ferg, Kendrick Lamar, Young Thug, Future and more. It was his second project in a matter of months following the release of September 2017's Carnival III. Today, he unleashes a new song with Canibus titled, "Letter To Canibus." Wyclef Jean and Canibus have a lot of history together that they dig through on their new collaboration, "Letter To Canibus." The song finds both rappers swapping bars back and forth and opening about some of the tension between them over the years. Canibus signed to Wyclef's Refugee imprint prior to his debut album which Wyclef was tapped to produced. After the project failed to succeed, Canibus placed the blame on Clef. This also came around the time when Canibus had feud with LL Cool J. All of these situations were ultimately mentioned in Wyclef's new song. 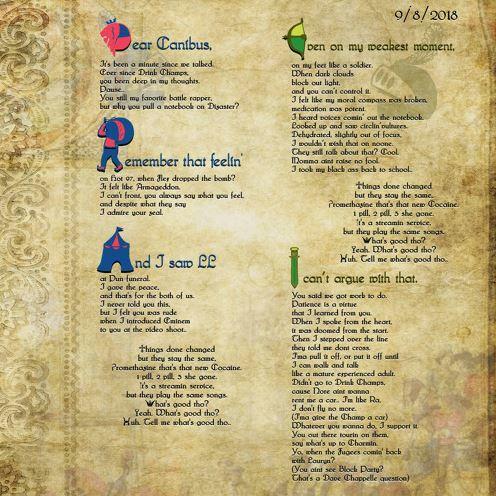 "Letter To Canibus" serves as the first single off of Wyclef's forthcoming mixtape, Wyclef Goes Back To School which is scheduled to drop on September 6th. SONGS Wyclef Jean & Canibus Team Up On "Letter To Canibus"